ROI is a concept that, little by little, has become a part of the daily routine for marketing teams as well. In addition to upper management, most marketers need to keep track of the efficiency of their marketing actions and know their marketing value in ROI. But what exactly is ROI and how to calculate ROI of marketing? If an advertisement campaign has cost $3,000 in total and it has produced $15,000 in additional sales, its ROI would be (15000 − 3000) ÷ 3000 × 100 % = 400 %. ROI works best to determine the value of short-term campaigns, because then the profit margin can directly be compared to previous numbers. However, ROI can also be used to assess the efficiency of your marketing actions in the long run, and it can help you find the most efficient marketing channels for you. What is a good ROI? When it comes to marketing, you should aim for an ROI of at least 500 %. This is due to the ROI formula not taking the costs of production, fixed company costs or personnel costs into account. It is also important to keep in mind that the ultimate goal of the company, and therefore marketing as well, is to make profit. What is included in marketing costs? To be able to calculate the ROI of marketing, you need data about the profits and investments of your company. Google Analytics, for example, shows you your sales revenue and other goals which you can compare to your investments. You can import data from different channels, for example your billing system, CRM or online store, to your marketing automation tool to see the bigger picture. A comprehensive automation tool combines data from different channels and tells you if an unidentified website visitor has finally turned into a buying customer, and where they came from. This means that you can compare your investments and profits of different marketing channels to find the most efficient channels. 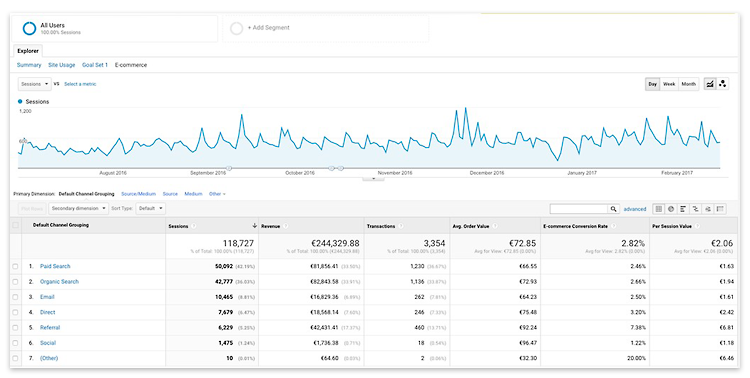 Image: You can see your sales revenue straight from Google Analytics. There are also separate ROI tools on the market that can be integrated with marketing and analytics tools and count your profit margin for you. For example, Funnel tool calculates your ROI according to your data, also taking different currencies and currency changes into consideration. When calculating the efficiency of different marketing channels it is important to determine key metrics in marketing – what do you want to achieve with your marketing? Getting more buying customers is often the goal in consumer-oriented companies but in sales-oriented B2B organizations marketing aspires to produce valuable leads to the sales team. You must pay attention to essential key metrics when determining your ROI throughout the buyer's journey. What is the average profit of one lead? At what point does a newsletter subscriber or a person who clicks on a Facebook ad become a lead that is directed to the sales team? And how does a potential customer at the very beginning of the buyer's journey become interested enough to subscribe to the newsletter or click on a display ad? Image: Different technologies are utilized at different stages of the buyer's journey. Determining the ROI for the channels at the start of the journey is challenging but necessary. When counting the ROI of these channels, you have to go backwards on the buyer's path and see what percentage has advanced from one stage to the next. This will give you a clear picture on how efficiently your investments in, for example, Facebook content marketing are being returned to you. Merely calculating your ROI doesn't really help if you don't act accordingly. Marketing tools and processes have to continuously adapt, due to the ever-changing market. An ROI that was calculated six months ago doesn't necessarily tell you anything about the current situation. You should also direct your gaze into the future. Predicting the future is never an exact science. However, keeping a close eye on analytics and utilizing different scenario tools can help you find out which channels are most likely to produce the most revenue in the future. How to use marketing automation for increasing your ROI? Read our comprehensive 18-page guide on marketing automation and increase the profit margin of your marketing actions! Veera is a Visual Marketing Specialist at Liana Technologies. She is fond of everything having to do with design: from photography to graphic design and illustration. In her free time, Veera enjoys doing weird poses in weird places and lifting heavy objects and putting them back down. You can connect with her on LinkedIn.